Mito, Audi Q7, RS5, RS6 Avant, TT, MB ML63, VW Touareg, Golf 6, Subaru Impreza (Serj999), Harley Davidson (Onixer), some skins by IJ’s Mods. For version 1.23.x and higher. Version 3.6 – added BMW 5 Touring(F11), Ford Mondeo Wagon, Nissan Primera Wagon, Opel Astra G Caravan, Volvo V40, Volkswagen Passat B4 Variant. 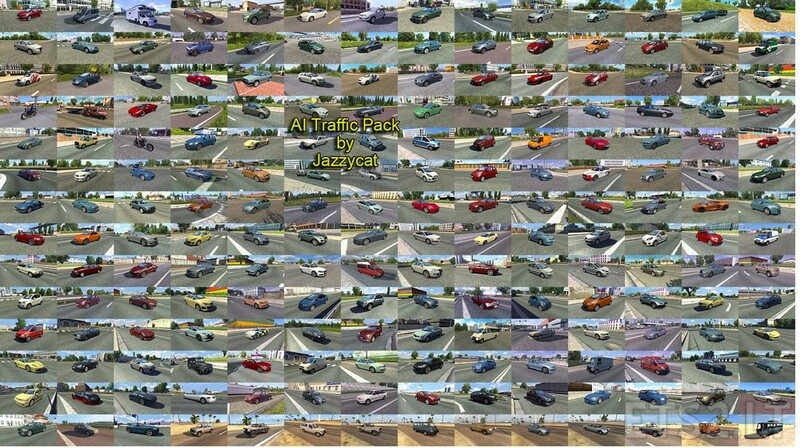 @Jazzycat, when are you going to update your traffic/AI packs for ETS2? Also, when you update your Russian traffic/AI mod/pack, can you please add RAF 2203 Latvija, MAZ 7310, MAZ 537, GAZ 21 Volga & GAZ 53 as well? Hy Jazzycat…simply wonderful mod as always!! J have a little question/request for you…. :”will be possible to update your Bus Traffic Pack by Jazzycat to make it compatible with ETS2 1.23 version ?”……Thanks in advance and sorry for my english!! bye from Italy..
Great Work, was extraordinary …. Jazzycat a suggestion would be possible to make Brazilian Traffic Pack to version 1.23 of ETS2? Me too. I’d love for him to update the Russian car pack & add RAF 2203 Latvija, MAZ 7310, MAZ 537, GAZ 21 Volga & GAZ 53 into the updated pack as well. Can you add Nissan Juke please ? Great work Jazzycat, can you add Passat 2015 please? The problem that I have with this mod is that it keeps crashing on 1.23x for some reason. tausend dank das du so schnell reagiert hast. nach dem neuen, alleszerstörenden update von scs waren deine mods ja nicht mehr kompatibel. mit deiner v.3.8 läuft dein mod wieder. 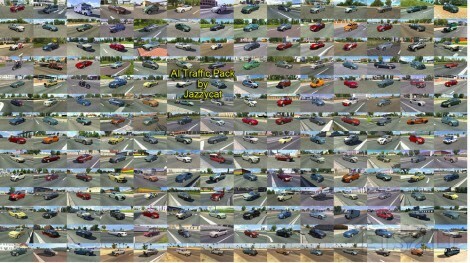 und jazzycats ai traffic mods sind nun mal die besten.